The Port Douglas Artists' Beach House is a holiday rental, beside the beach in Port Douglas, Far North Queensland, Australia. The Artists' Beach House has been featured in magazines, digital media, and newspapers internationally, gathering some amazing reviews. It was recently voted one of the best beach houses in Australia. The Beach House features five spacious bedrooms (sleeping up to 11), two living rooms, two bathrooms, and balcony, decked garden sitting area, expansive gardens backing onto a creek filled with towering rainforest and paperbark trees. It also has a private pool to laze the days away. The Beach House is child friendly, suiting large families, two families, or groups of friends looking for somewhere to truly relax and feel at home. It is also perfect for couples who want to luxuriate in privacy of a large breezy house. 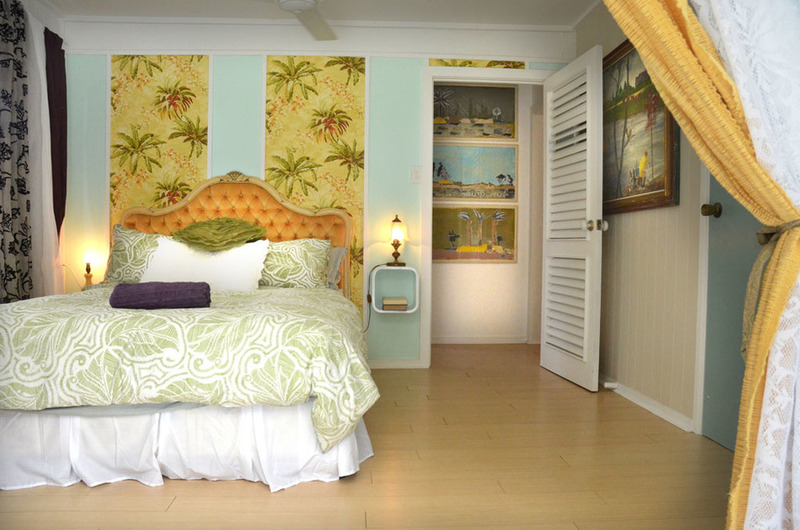 The Beach House was built in the 60's, and was recently renovated to celebrate old-style tropical living. Filled with major collections of inter/nationally renowned artists, as well as eclectic and stylish furnishings, the Artists' Beach House finds the perfect balance between comfort, and cool, artistic contemporary style with an affordable price. If you are looking for a holiday rental where you can truly relax, and feel instantly at peace, then the Artists' Beach House is it. We have games, books, dvd's and toys as well as chairs, picnic baskets, esky and rugs to take to the beach. The house features unlimited internet access, as well as unlimited local, mobile and national phone calls. The kids love the ambiance, the colour and all we have to play with. 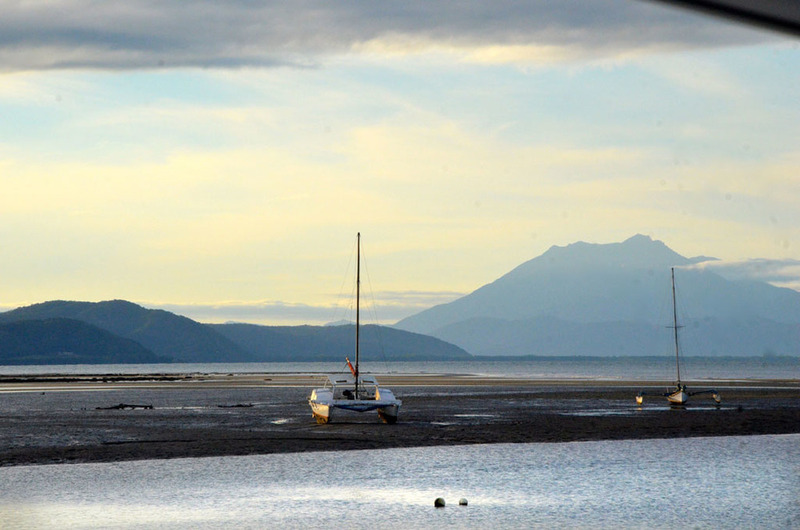 On booking, we will send you a large compendium filled of great local ideas of enjoying Port Douglas and the region. We love to share our local knowledge of the area. Although I’d like to keep this place a secret so we can be assured of rebooking it when we next go to Port Douglas I don’t think that would be fair. I’ve been very lucky to have done a lot of travel to many beautiful places but I would have to rate Port Douglas and more specifically the Artist’s Beach House as one of the best places I’ve stayed in. The fully self contained kitchen features a large two door fridge with ice maker, stove, dishwasher and kitchen servery to the balcony. The kitchen has all the kitchen appliances you should need, including juicer, food processor, and blender. The house features two living rooms. The upstairs open plan living room is open to the kitchen, with a large leather couch and a flatscreen TV, as well as Bose Stereo. The dining area is perfect for dinner parties, seating up to 11. Connecting via bi-fold windows and doors, is the balcony which has a weber bbq and another ten seater table for outside dining. Think beautiful dinners, and great conversation under the starry nights, watching the moon!! The reading room boasts more couches to laze away the day and many coffee table books... So read away, or just contemplate the view. The master bedroom is also airconditioned and spacious, with queen bed and french doors overlooking canopies of rainforest trees. The upstairs bathroom, is near to the master bedroom has a shower and toilet. The second bedroom is also upstairs, overlooking the mango tree. This has two singe beds. Downstairs features a large living room with 50 inch digital TV. It has a huge bookshelf filled with games, books and dvd's. There is also a toy box for the kids. The third bedroom, also air-conditioned, is a spacious room with a queen size bed, and boasts a view to the pool. This room has two sets of bi-fold doors that open to the garden and a private sitting area. The fourth bedroom, also air-conditioned, features a queen size bed, with door to ensuite bathroom. This room also has a flat screen tv. The fourth bedroom opens up to a private deck and garden via french doors, This room also has a set of large casement windows that capture the sea breeze. The fifth bedroom, also air-conditioned, has two single bed (with two pull out single trundle beds if needed). Under the stairs there is another area filled with picnic blankets, picnic sets, beach toys, fishing reels and lots of things to take to the beach. Situated in an exclusive and quiet area of Port Douglas, you can stroll to the beach in a minute. There are also a range of restaurants and bars in walking distance. The main street is a couple of minutes drive away, or alternatively, take a twenty minute stroll to town via the beautiful Four Mile Beach. The Artists' Beach House is set on a spacious property, fronting onto a quiet crescent. The house overlooks a towering grove of bamboo, giving it a secluded, private and serene feel. The property backs onto a fenced creek (where the kids can fish). The view from the house looks out to paperbark trees and tropicral rainforest Throughout the days and nights, nature surrounds you, with bird calls resonating, singing insects and melodious tree frogs. The Beach House sides onto a direct beach path to Fourmile Beach, only 100 meters away. The path leads to a more private part of the beach, away from the crowds. 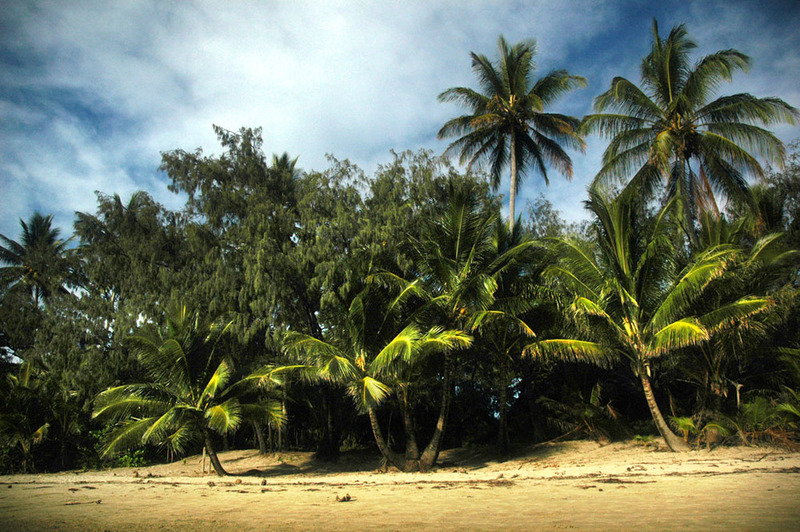 Fourmile beach is a perfect walking and safe swimming beach, safe, fringed with coconut palms. Morning sunrise walk and swim is a perfect way to start the day. We also have collapsable chairs and sun lounges to take to the beach. A perfect way to end the day is to take the chairs and some champagne to watch the sunset. With plenty of sunshine, beautiful warm seas, refreshing sea breezes and a warm climate all year round, Port Douglas weather is always wonderful. 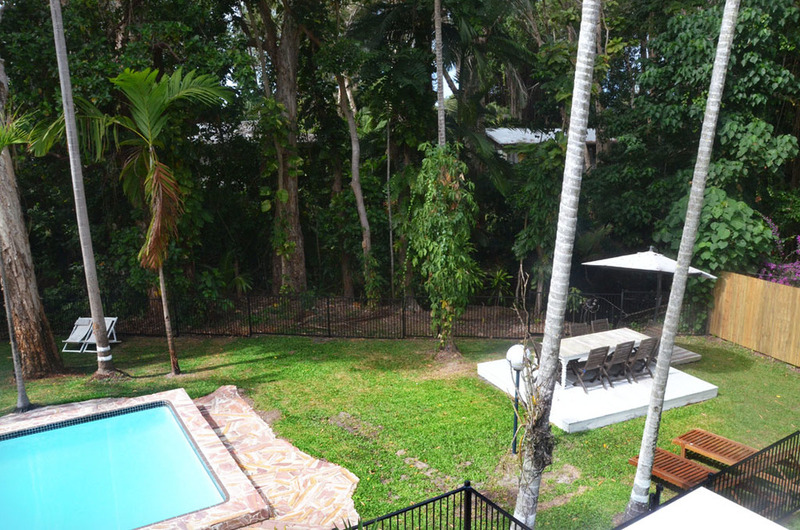 Situated in an exclusive and quiet area of Port Douglas, you can stroll to the beach in a minute. There are also a range of restaurants and bars in walking distance. The main street is a couple of minutes drive away, or alternatively, take a twenty minute stroll to town via the beautiful Four Mile Beach. Winter (Dry season) starts in May and finishes in October offering sunshine, fresh breezes and relatively low humidity. Summer is quieter, extends from November to April and refreshes the region with incredible tropical afternoon downpours, abundant tropical fruit, and less people. This is a spectacular time of year. The tropical vegetation is abundant and the forests are filled with clear streams and many waterfalls to cool off in. Ocean water temperatures range from 23 degrees Celsius in July to 29 degrees Celsius in February. Thanks to the beautiful Port Douglas weather you can swim all year round. The 'best' swimming season runs between April and October. Between the months of November and March, Port Douglas is home to the box jellyfish, so special swimming enclosures are erected at Fourmile Beach to protect swimmers. The Artists' Beach House is situated in the exclusive and quiet Solander area of Port Douglas, a few minutes drive (or local bus) from the main street and marina. You can also walk to town via a beautiful stroll down Fourmile Beach. However, a few minutes walk away are both casual and fine dining restaurants and bars (including the fantastic QT bar). Within 10 minutes walk are 2 championship golf courses, and The Habitat Wildlife Sanctuary. Five minutes walk away is the Moonlight Cinema. Watch the latest movies under the stars! 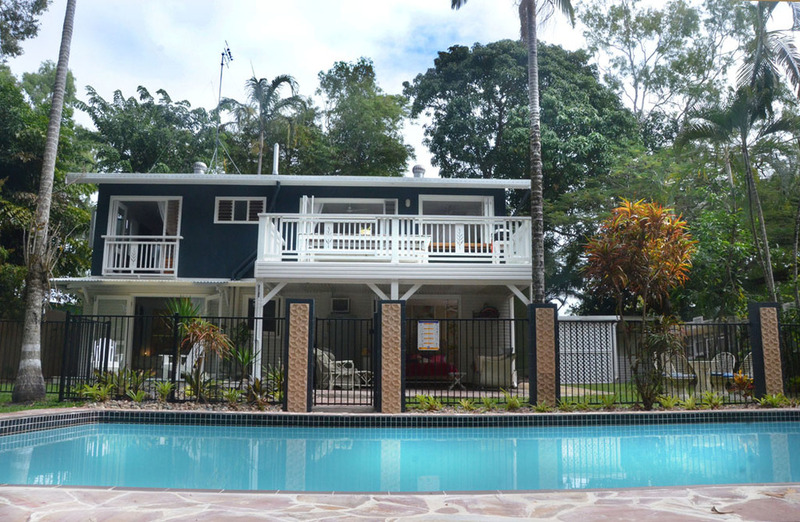 Its a perfect location for restful holiday, and is much quieter and peaceful than staying in the heart of Port Douglas. Port Douglas is a small village, on the coast of Far North Queensland, Australia. It is situated a spectular hours drive north of the international airport in Cairns. The only place where two World Heritage listed areas sit side by side, Port Douglas offers spectacular tropical landscapes and exhilarating natural adventures. Port Douglas hass something for everyone. The balmy tropical climate year around keeps visitors coming back again and again. The distinctive laid back atmosphere, the breathtaking beauty of the scenery, morning strolls along palm-fringed Four Mile Beach, world championship golf courses, the marina, five star restaurants, local artist's galleries, boutique designer stores, wonderful supermarkets and gourmet food supplies, finished off with relaxing moments in the sidewalk cafes. Port Douglas is a wonderful for a relaxed and safe family holiday. Port Douglas is the perfect place to explore the Great Barrier reef, the world's largest coral system and the world's biggest single structure made by living organisms. Port Douglas is the closest town and departure point to the World Heritage listed Great Barrier Reef, with 12 tours departing daily to the outer reef and Low Isles inner reef areas. The Farmer's Market every Sunday is a wonderful mix of arts, crafts and local produce. There are amazing experiences diving spectacular Great Barrier Reef that can not be missed. Try a refreshing swim in the crystal clear waters of Mossman Gorge, or Spring Creek to revitalise the soul. Go sailing, spend a day lazing on the many (most empty) beaches. Laze the day away on nearby Low Isles. 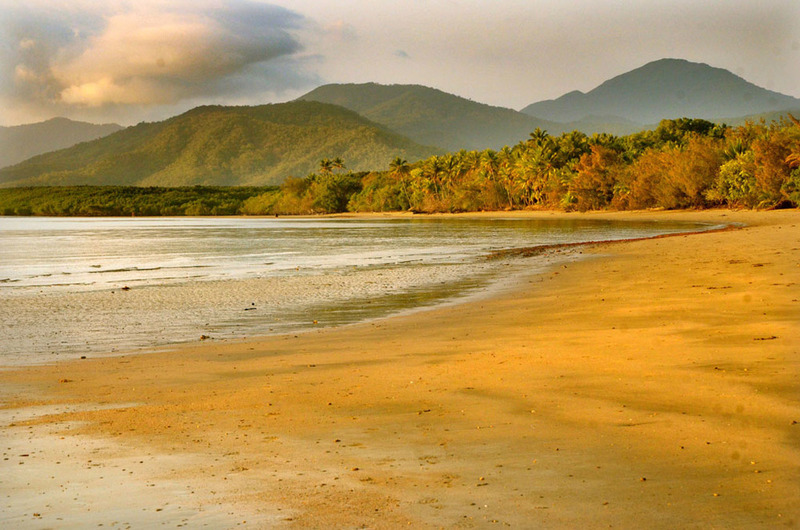 Hike scenic trails to Cape Tribulation where tropical rainforest and coral reef meet. The area is unique, a rainforest that has been in existence for more than 120 million years and contains some plant and animal species not seen anywhere else in the world. 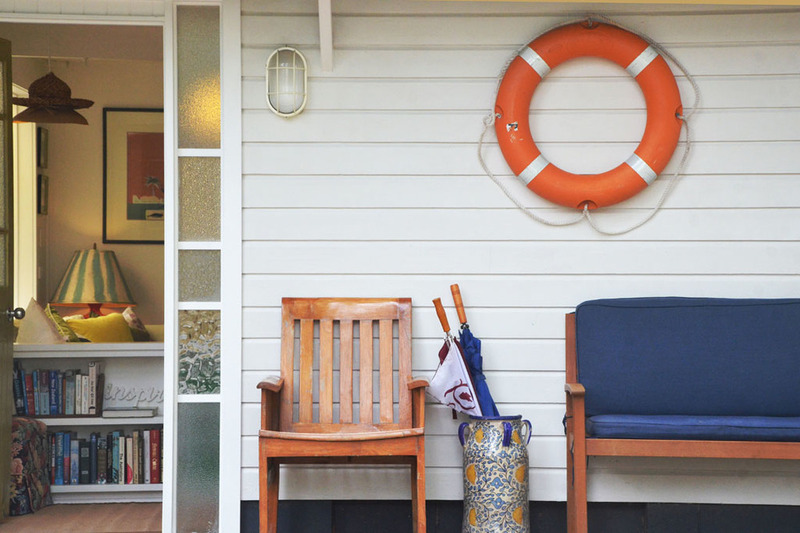 Take a cruise up river and come face to face with large crocodiles and pythons in their natural habitat from the comfort and safety of a cruise boat... Or just spend quiet days lazing about in the Port Douglas Artist's Beach House. High Season dates: Christmas, Easter, 1st May to 1st November. At the Artists Beach House, we have a seven night minimum in the High Season. Our rates start at $485 per night for up to six people. Over six people there is a $40 per person, per night charge for the total duration of the booking period (maximum of eleven people). If you would like a longer booking, one month or over, please get in touch. Under seven nights is a $250 cleaning charge. Low Season dates:Late January, February, March, April (except Easter), November,Early December. 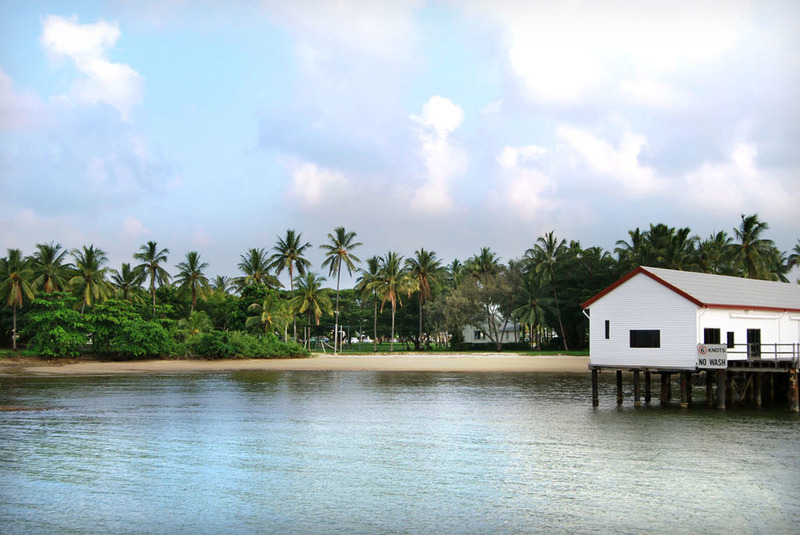 At the Artists Beach House, we have a five night minimum in the Low Season. Our rates start at $335 per night for up to six people. Over six people there is a $30 per person, per night charge for the duration of the booking period (maximum of eleven people). If you a looking for a longer break, this is the perfect time - over this time, we can do booking for up to three months. Please get in touch. No parties, no loud noise after 9pm. No smoking inside, no shoes inside and please leave the Beach House in a tidy state. If anything is broken, please let us know.